One of the reasons Cordelia Vizcaino of electro-indie pop band, Cordelia & The Buffalo, became a musician was because her teacher told her not to do so. 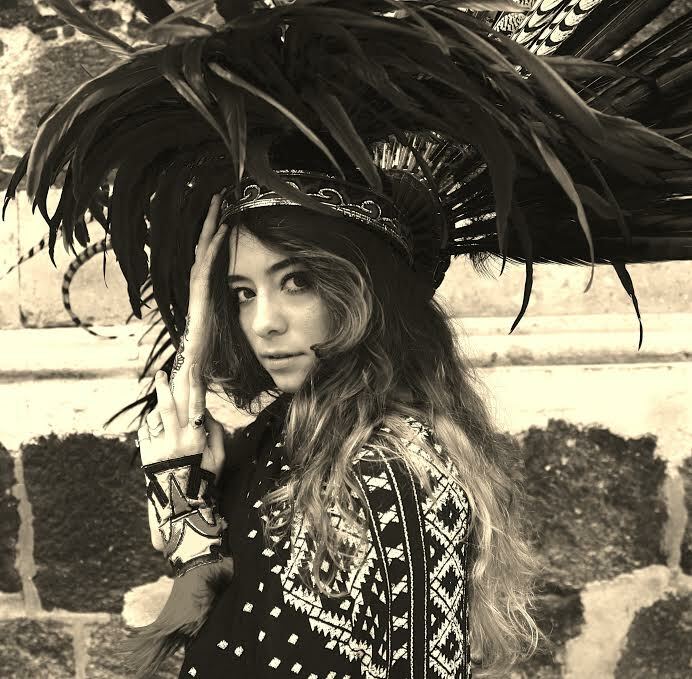 Since then, she has continued to defy rules and fought back with her music, speaking against the Venezuelan military police in one of her tracks, and creating a unique sound inspired by Mexican Indian and Native American tribes. Composed of members from diverse backgrounds, the band’s “purpose is to give voice to those who aren’t listened to.” Continue reading our interview with Vizcaino to learn more about the band, how they continue to give back to the community, and what the Buffalo has to do with any of this, and be sure to take a listen to their latest single, “Free” off their self-titled debut EP out now! Gadfly Online: Can you provide us with some background? Where are you from? Cordelia Vizcaino: I (Cordelia) was born in Houston, Texas but raised mostly in Monterrey, Mexico. Diego Diaz, the drummer, was born in Boston but raised in Venezuela. Rodrigo Gamboa, one of the guitar players, was born and raised in Venezuela. Dag Eirik Hanken, the percussion and trigger player, was born and raised in Oslo, Norway. Yusuke Sato, the other guitar player, was born and raised in Japan. Daniel McCallum, the bass player, was born and raised in Alaska. CV: There are two events in my life that made me realize I wanted to pursue music: When I was 13 years old and wrote my first song on the piano and the day a teacher discouraged me to pursue music for a living. GO: How would you characterize your music? CV: As a series of paintings. Every song has its own color, atmosphere, unique instruments, and sound designs I solely create to tell a different story each time. The joy of creating them is finding a balance between each color, mood, light, texture, and composition. GO: Do you fit into a stock genre or create a fusion of genres? CV: The stock genres we are usually classified into are indie-pop, indie-electro, world, or alternative. It very much depends on which song from the EP you’re listening to. Truthfully, a few days ago during rehearsal we jokingly used “Tribal – Indie” to describe our music, and we’ve slowly realized how much it really defines us. I have a deep love and admiration for different ethnic tribes and their percussive instruments, colorful wardrobe, and vocal hymns. They have an astounding organic connection to music that inspires me everyday to develop eclectic fusions of instruments, rhythms, and lyrics that aim to lift the listener’s spirit. CV: Little Dragon, Imogen Heap, Friendly Fires, Lido, Toro y Moi and just about any artist who is daring enough to play and find new ear candy to marry into their work. Since a young age, I’ve also had a love affair with all things Mayan and Aztec from my heritage, but most of all I am quite infatuated with instruments with character from all over the world like the Flageolets (Aztec Flute), the Ayoyotl (Aztec jingles), the Mayan panpies, the vertical wooden drum (known as ‘huehuetl’), the African Sansula, marimba, the Caribbean steel drums, and the African Burundi drums. These are some of my favorites. GO: What project are you promoting right now? CV: We are promoting our recently released debut EP. GO: How does this fit into your overall career arc? CV: This is definitely a peak for us. Up until January 23, 2015 (our release date) everything was still in the process of creation. The brand, the image, the logo, and the sound finally congealed in 2014. There’s a certain art in watering your little project plant. If done regularly with the right nourishment, little by little you’ll start to see the fruits of your labor. GO: What do you hope to communicate to listeners through your music? give voice to those who aren’t listened to. A good example of this is the fourth track of the EP, “Hand Like Guns.” It speaks of an imaginary conversation I have with Venezuela’s military police that currently suppresses and takes the lives of many who are fighting to survive in spite of the receding vital supplies in their country. What inspired me to write about their story were our Venezuelan fans and the two Venezuelan members in our band. The song paints the anxiety that they live in and the constant fear that the next call they get could dictate the life, death, or liberty of a loved one that has fallen into the hands of the authority. The government has blocked all social networks, controls all newscasts, and the ability of this country to express their agony through the media. Fortunately, music is the purest form of communication that man has created, and the only one that can’t be muffled. So, what better instrument than The Universal Language, to say what muted lips can’t? GO: What does music mean to you? Why Buffalo? CV: It is my Buffalo. The Buffalo is my experientialist alter ego incarnated. It started out with just a tiny little piece of my soul, and then it took a life of its own. Buffaloes (or Bison) are considered a sacred animal in many Native American Cultures, a beacon of life. Every single part of the animal was indispensible for their well-being and survival. Their fur was warm clothing, their flesh a nourishing food source, and their horns powerful weapons against all danger. Music is no different to me. Buffaloes also travel in herds that help each other stay brave, honest, and perseverant, which is why I strive to preserve that feeling of camaraderie with my band mates, and listeners. My herd. My brothers. Our Tribe. The Buffaloes are all those people, musicians, engineers, fans, those that believe in us, even those that haven’t, and those that have helped us keep The Buffalo alive. An entity that represents all those who have joined The Herd that will be Heard. CV: A new music video for one of the EP singles, several live session videos/interviews, our performance at Osheaga Music Festival, and a new four-track EP coming in the near future. GO: Whom is your music geared towards? How is it impacting them? CV: It is an opening statement to a conversation with anyone and everyone who wishes to Join The Herd. It is the most fun to hear the reactions from age groups ranging from a smiling newborn all the way to the young at heart who write us letters thanking us for spreading their message through our music. GO: In other words, why should we listen to your music and message? CV: Because we’ll listen to you in return. Our slogan is Join The Herd because every single person that is part of our project counts. We feel lucky that our music has forged a strong bond with our listeners, so whether that be to invite them to “Be a Buffalo for a day,” which invites someone to spend the whole day with us, or free tickets to our show on their birthday, we focus to give back something creative in return for their loyalty. GO: Can you expand on the “personal journey to freedom” mentioned in the press release? become—if you believe in that sort of thing—so I wanted each song from this EP to symbolize the moment you find a different piece of your own puzzle. My music is like my cheap psychologist sometimes. As cliché as it may sound, this EP is really what kept me going for the past three years, and it came to represent the blueprint of what is now Cordelia & The Buffalo.